In principle PLD is a very simple process with many similarities to sputtering also discussed on these pages, however instead of ablating the target with ions the target material is ablated by a powerful laser. A simplified layout of a PLD chamber is shown below in figure 1. Figure 1. A simplified layout of a PLD chamber. The basic PLD process is to hit the target, which is made of the material you want to deposit as a film, this ablates the target and produces a plume of the material. This leaves the target surface approximately perpendicular if a substrate is placed somewhere in the plume material will arrive on its surface and a film will start to form. Similarly as with other growth processes the substrate is heated to try and ensure uniform growth of the film. The process is carried out in a vacuum chamber with pressures ranging from 10-6 mbar to UHV 10-10 mbar, however it is then common to use a background gas pressure of to improve stoichiometry of the film grown (ie. in the case of oxides a background pressure of oxygen would be used). The ability to use such background gasses is one of PLD main advantages over other methods. In a real PLD system the chamber would be equipped with a load lock to allow for transfer of samples, substrates and targets into and out of the chamber without venting the main chamber. Also it is common to have a target carousel which allows multiple target to be used allowing the growth of complex multilayer materials with relative ease. In order to monitor the film growth the chamber could also be equipped with a RHEED system and by monitoring the intensity of the reflected beam it is possible to see layer by layer growth occurring. An image showing a PLD plume is shown in figure 4. A variety of different lasers can be used for PLD however they need to output a sufficient power in order to ablate the target material (approximately 1J/cm2 ), this allows different laser to be used with different materials. In general the laser appropriate for PLD are in the range 150nm to 400nm ie. UV as this is where most materials show strong absorption, as UV lasers are not visible to humans extra safety precautions are needed to work with these lasers usually enclosed beams and UV filtered goggles. In order to achieve the necessary power output the lasers are pulsed with rates upto 100Hz although 10Hz is commonly used for high quality films. The formation of layers grown by PLD differs from other techniques in that when the laser is pulsed a super saturation of the target material arrives at the substrate surface. The super saturation causes a large number of nucleation sites to be formed this helps the film to grow uniformly. In PLD the control of the stoichiometry of the film come from the ability to produce a target with the desired composition, this is compared to techniques such as MBE where the composition has to be produced bycontrolling the ratio of the different sources arriving on the substrate, this gives PLD an advantage in that is should be possible to control the film stiochiomery very precisely. PLD can be used to deposit a very wide range of materials including Metals, Semiconductors, Borides, Carbides, Nitrides, Oxides, Flourides, Silicides and Sulfides and many of these could be grown in multilayers making PLD a versatile technique. The ability of PLD to operate with high background pressure of reactive gasses (eg. oxygen) is possibly it most useful feature. This allows the stoichiometry of oxide targets to be maintained during grown of thin films, this has allowed the production for complex oxide thin films such as SrTiO3 LaAlO3 and Yttria-Stabilized Zirconia (YSZ). These materials and the interfaces between them have sparked much interest due to there superconducting properties. The production of simpler oxides such as ZnO in thin films also has technological implications ZnO is a transparent conductor, making it useful for solar cells and display technologies. In their bulk form, oxides such as ITO (Indium Tin Oxide) and ZnO are not transparent, and as such must be deposited as thin films onto a substrate in order to produce a TCO (Transparent conducting oxide) material. As the complexity of devices based on TCO materials increases, enhanced optical and electrical properties of the TCO films are essential. Hence, the deposition techniques play an important role to improve the film properties. These techniques include chemical vapor deposition, vacuum evaporation, sputtering, spray pyrolysis, and Pulsed laser deposition (PLD). The process of PLD is well suited to the deposition of complex oxides . This is due to the similarity in stoichiometry between the ablated target and the deposited thin film, unlike films deposited through thermal evaporation, where the composition of the film is dependent on the vapour pressure of the elements in the target. Pulsed laser deposition is often described as a three-step process consisting of vaporization of target materials, transport of the vapour plume, and film growth on a substrate.These three steps are repeated thousands of times during the deposition run. Laser pulses rarely remove material in a clean and layer-by-layer style. Instead, target surfaces become altered both physically and chemically. Morphological changes take the form of periodic structures like ripples, ridges, and cones . A basic thermal cycle is illustrated in Figure 2. 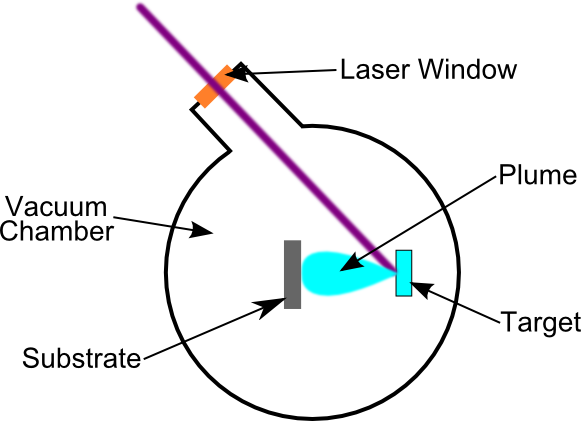 Figure 2 Schematic of the basic induced by a laser pulse. (a) laser pulse is absorbed, melting and vaporization begin (melted material showed by shaded area, arrows indicate motion of the solid-liquid interface). (b) Melt front propagates into the solid, accompanied by vaporization. (c) Melt front recedes (cross-hatched area indicates resolidified material). (d) Solidification complete, frozen capillary waves alter surface topography. The next laser pulse will interact with some or all of the resolidified material . The applicability and acceptance of pulsed laser deposition in thin-film research rests largely in its simplicity in implementation. Pulsed laser deposition is a physical vapor deposition process, carried out in a vacuum system, that shares some process characteristics common with molecular beam epitaxy and some with sputter deposition. 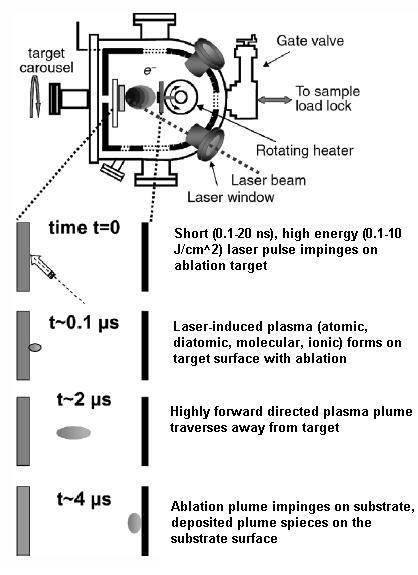 In PLD, shown schematically in Figure 2, a pulsed laser is focused onto a target of the material to be deposited. 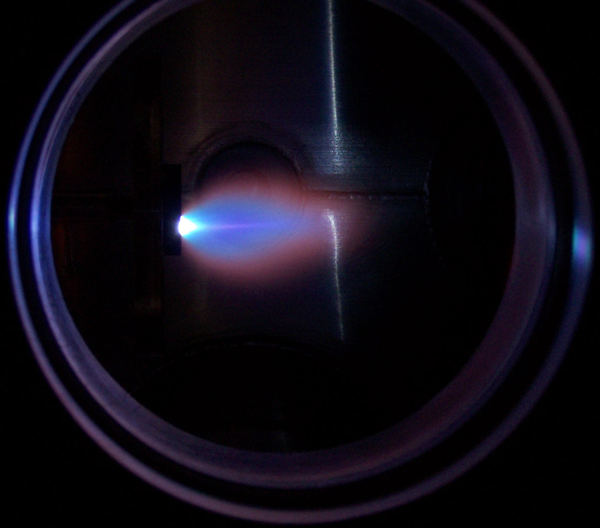 For sufficiently high laser energy density, each laser pulse vaporizes or ablates a small amount of the material creating a plasma plume. The ablated material is ejected from the target in a highly forward-directed plume. The ablation plume provides the material flux for film growth. For multicomponent inorganics, PLD has proven remarkably effective at yielding epitaxial films. In this case, ablation conditions are chosen such that the ablation plume consists primarily of atomic, diatomic, and other low-mass species. This is typically achieved by selecting an ultraviolet (UV) laser wavelength and nanosecond pulse width that is strongly absorbed by a small volume of the target material. Laser absorption by the ejected material creates a plasma. For the deposition of macromolecular organic materials, conditions can be chosen whereby absorption is over a larger volume with little laser absorption in the plume. This permits a large fraction of the molecular material to be ablated intact. For polymeric materials, transfer of intact polymer chains has been demonstrated. For even ‘‘softer’’ materials in which the direct absorption by th laser would be destructive to molecular functionality, the formation of composite ablation targets consisting of the soft component embedded in an optically absorbing matrix has been investigated. Several features make PLD particularly attractive for complex material film growth. These include stoichiometric transfer of material from the target, generation of energetic species, hyperthermal reaction between the ablated cations and the background gas in the ablation plasma, and compatibility with background pressures ranging from ultrahigh vacuum (UHV) to 1 Torr. Multication films can be deposited with PLD using single, stoichiometric targets of the material of interest, or with multiple targets for each element. With PLD, the thickness distribution from astationary plume is quite nonuniform due to the highly forward-directed nature of the ablation plume . Hanus, F. Pulsed laser deposition of high quality ITO thin films. Applied Surface Science.1996 96-98, pp. 807-810. Douglas B Chrisey, G.K.H., Pulsed Laser Deposition of Thin Films. 1994: A JOHN WILEY & SONS, INC., PUBLICATION. 612. Eason, R., Pulsed Laser Deposition of Thin Films. 2007: John Wiley & Sons, Inc.